Steeping grains for grass cutter. My fourth batch of home brew is already fermenting. free run 5.0 femmes The wife is a huge fan of Oberon by Bell’s Brewing, Inc. and has been asking, since I started home brewing, if I would be able to make her something similar. As long as this beer comes close, I will save myself the $40/case she spends on them during the warmer months. 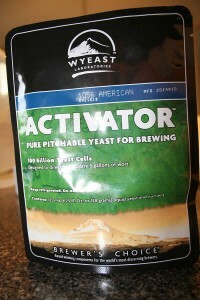 Used the Wyeast 1056 for this batch. Easy. First time not using Nottingham. Not that I am anywhere near being a good brewer but the brew day went off without much of a hitch. I hit my steeping temperature, boil came the typical 40 minutes after turning up the heat. Even the cooling went well. Maybe I am getting a good feel for the process and it is coming more common knowledge than short term memory. Chuck, a friend from my home brewing club, stopped by just before boil. We chatted about brewing, what we thought should happen with the beer club, his current switch to all grain, cost and time cutting tricks to brewing, had a few beers, and researched bourbon oak aging some home brew. I am very happy with this brew day and the ease with which it came off. While waiting for the boil, I dry hopped Ladies Day IPA with an ounce of Amarillo. That will be bottled in two weeks, the same time I will rack Grass Cutter to a secondary. Enjoy! 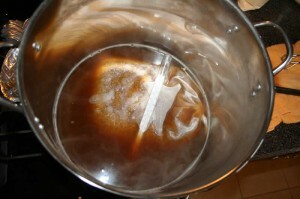 This entry was posted on Sunday, January 24th, 2010 at 7:45 pm	and is filed under Home Brewing. You can follow any responses to this entry through the RSS 2.0 feed. Both comments and pings are currently closed.